Colombo, Sri Lanka -- In recent history, we have not heard of Vesak full moon Poya day falling in April. Vesak has always been celebrated in May. One hundred and twenty two years ago, however, in 1885 Vesak Poya fell on April 28. A month earlier, on March 27, 1885, Governor Sir Arthur Hamilton Gordon had issued a proclamation declaring Vesak Poya a public holiday. It was the culmination of a campaign by the Buddhists to get some of their lost rights back. The event called for celebrations and the six-colour Buddhist flag flew high for the first time on that historic Vesak day. The Dutch had abolished the Vesak Poya holiday in 1770 and the British had ignored requests that it be restored. Following the arrival of Colonel Henry Steele Olcott in May 1880, the Buddhist revivalist movement gathered momentum. A Buddhist Defence Committee was formed on his initiative on January 28, 1884 following the inaction by the government to deal with the culprits who attacked a Buddhist procession at Kotahena, killing one person and seriously injuring at least 30 persons. The committee under the presidency of Muhandiram A.P. Dharma Gunawardena met at the Vidyodaya Pirivena at Maligakanda. The other members of the committee were Don Carolis Hewavitarana (Vice President), Carolis Pujitha Gunawardena (Secretary) and H. A. Fernando (Treasurer). Colonel Olcott was appointed an honorary member. The committee considered several issues relating to the injustices meted out to the Buddhists and at the inaugural meeting it was resolved to ask the British government to take action on identified issues. The resolution was proposed by Vice President Don Carolis Hewavitarana supported by J.P. Jayatilake and was seconded by H.A.Fernando. The need for the culprits of the Kotahena riots to be committed for trial. The British government should follow a policy of religious neutrality or guarantee the religious rights and privileges of the Sinhalese Buddhists. Vesak full moon Poya day be declared a holiday for Buddhist public servants. The removal of all restrictions on the use of national and religious music and the restoration of the right to hold processions which had been enjoyed by the Buddhists from time immemorial. The appointment of Buddhist Registrars of Marriages in Buddhist villages. The removal of anomalies and the formation of a proper management system for Buddhist temporalities. Colonel Olcott undertook to go to London and personally meet Lord Derby and discuss the issues raised. The Buddhist Defence Committee decided to celebrate the historic announcement of the Vesak holiday and a sub-committee comprising Venerable Hikkaduwe Sri Sumangala Thera, Venerable Migettuwatte Gunanada Thera, Don Carolis Hewavitarana, Muhandiram A.P. Dharma Gunawardena, William de Abrew, Carolis Pujitha Gunawardena, Charles A. de Silva, N.S. Fernando, Peter de Abrew and H. William Fernando was appointed to make the arrangements. A key item in the programme for celebrations was the ceremonial hoisting of the Buddhist flag in the major temples in and around Colombo. The idea of designing a Buddhist flag was mooted by the Colombo Committee organising the Vesak celebrations and was hailed by Colonel Olcott who made the following observation in his 'Old Diary Leaves': "It was at this time that our Colombo colleagues had the happy thought of devising a flag which would be adopted by all Buddhist nations as the universal symbol of their faith thus serving the same purpose as that of the cross does for all Christians. It was a splendid idea and I saw in a moment its far-reaching potentialities as an agent in that scheme of Buddhist unity. Our Colombo brothers had hit upon the quite original and unique idea of blending in the flag the six colours alleged to have been exhibited in the aura of the Buddha." 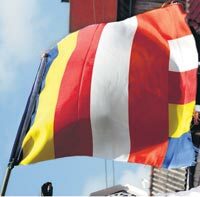 Carolis Pujitha Gunawardena has been credited as the designer of the flag which appeared for the first time in the Sinhalese newspaper 'Sarasavi Sandaresa' on April 17, 1885. The design consisted of the six colours 'nila' (sapphire blue), 'pita' (golden yellow), 'lohita' (crimson), 'odata' (white), 'manjesta' (scarlet) and 'prabhashvara' (mixture of the five). The flag took the shape of a long streaming pennant which Colonel Olcott commented would be "quite unsuitable for carrying in processions or fixing in homes". He suggested that the flag should take the shape and size of usual national flags. The proposal was accepted. And thus was born the Buddhist flag which will be raised at Buddhist homes on Tuesday, May 1, this year's Vesak full moon Poya day.